Titanic question: How do you lose track of Brandon Marshall? 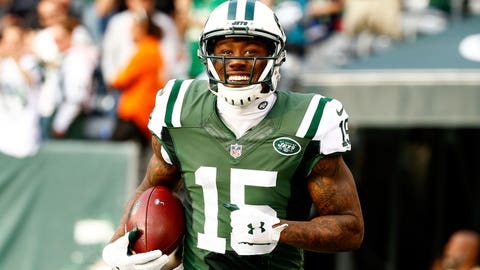 Brandon Marshall is a big wide receiver for the New York Jets — both literally and metaphorically. He’s 6-foot-4, 230 pounds and had caught 10 touchdown passes entering Week 14. Despite all that size and talent, the Tennessee Titans somehow forgot to cover him Sunday on this strange play. With 1:44 left in the first half, Marshall lined up on the far right side of the formation. There was no defender across from him, so he wisely alerted quarterback Ryan Fitzpatrick to snap it and get him the ball quickly. Fitzpatrick did just that and found Marshall for a ridiculous 69-yard touchdown to give the Jets a 27-0 lead before the half. The play happened so quickly that not even the camera crew was ready for the snap. The only guy somewhat aware of what happened was 305-pound Titans defensive end Jurrell Casey. He tried to chase down Marshall but ran out of gas. It was Marshall’s 11th touchdown catch of the season — and by far the strangest one of them all. In the first half alone, Marshall racked up four catches for 100 yards — his eighth game with at least 100 yards this season.